Home > Africa > Will hunger crisis fuel child marriages? Will hunger crisis fuel child marriages? 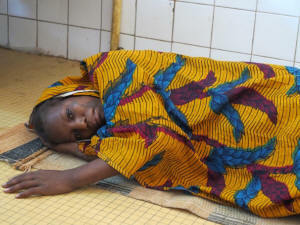 Balki Souley, 14, lost her baby during childbirth in a hospital in Maradi, Niger. Hospital officials said it was because of her age and the fact that she had eaten very little during her pregnancy. “When I return to my village, I will try to have another child,” said Balki, who was married at age 12. Photo: Sudarsan Raghayan/Washington Post Each day, more than 25,000 girls younger than 18 are married across the world. Here is a look at some of them. Balki Souley lost her son during childbirth the other day. Her body was so frail, so weakened by a lack of food that she, too, nearly died. “When I return to my village, I will try to have another child,” she said shyly as she lay on the floor of a crowded maternity ward.